An interesting thing happened last season in interleague play. The American League won 53% of the games. That’s not the interesting part. The AL has won the majority of interleague games for 14 years in a row. But while that was happening, the NL did take one step forward. The designated hitter is an AL thing, something that AL teams have to actually plan for. NL teams kind of just wing it. And yet NL designated hitters in 2017 out-hit AL designated hitters. Here’s a plot of league DH wOBA, going back to the start of interleague play just over two decades ago. Over 21 years, NL designated hitters have out-hit AL designated hitters three times. Last year, the gap was 11 points of wOBA. In 2009, the gap was 16 points. And, in 2003, the gap was an incredible 31 points. Weird things happen, but, again, it shouldn’t be surprising that the AL is usually better here. Those teams invest in the DH position. Their DHs are used to the work. The NL just benefited from a little bit of randomness. 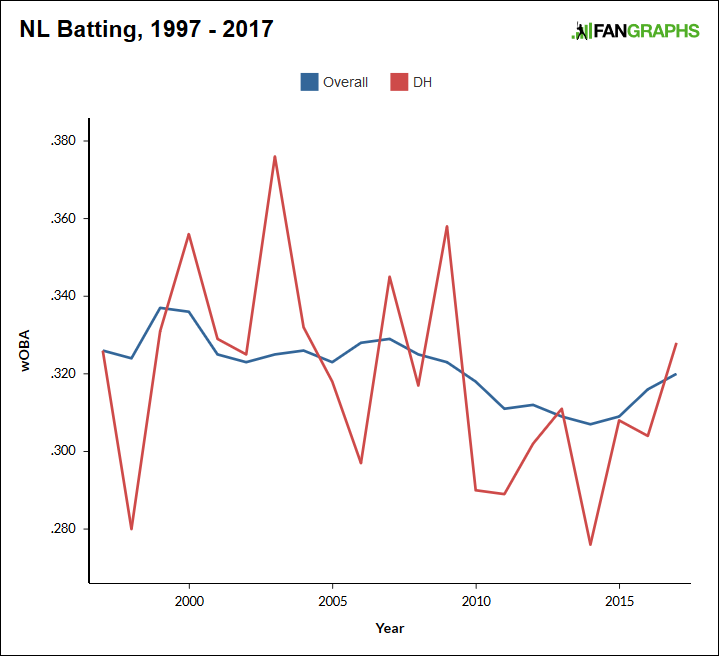 Historically, the NL DH numbers have bounced around, which is simply a function of small samples. In each year, NL DHs come to the plate only some hundreds of times, which allows for volatility. Here’s a plot of the last 21 years, with a line for NL batters overall, and a line for just NL DHs. You can see how the red line plummets and spikes. In fairness, NL DHs only bat against AL opponents, and AL opponents have tended to be stronger for a while, so that’s a minor factor. But just examining the whole window, the NL has averaged a .322 wOBA, while NL DHs have averaged a wOBA of .319. In the AL, for the sake of comparison, the DH has pretty much always out-hit the overall player pool. But! Finally, this post can get to the point. A few days ago, in the FanGraphs Slack channel, Chris Mitchell, of KATOH fame, pointed out a factoid he came across. The fact, in words: In the most recent season, designated hitters were not particularly good. They weren’t bad, but, think about it. What is a designated hitter? A hitter who is designated to hit. A hitter who has no other responsibilities. Designated hitters don’t need to field or pitch. Therefore, in theory, it shouldn’t be hard for teams to find good-hitting DHs, because you don’t need to worry so much about athleticism. I don’t need to explain the concept to you. Very obviously, the bar for a hitter at DH is fairly high. Or, it should be. Something last season went bonkers. The designated hitter was introduced to the American League in 1973. That means we now have 45 years of information. Here is a plot similar to the one above. 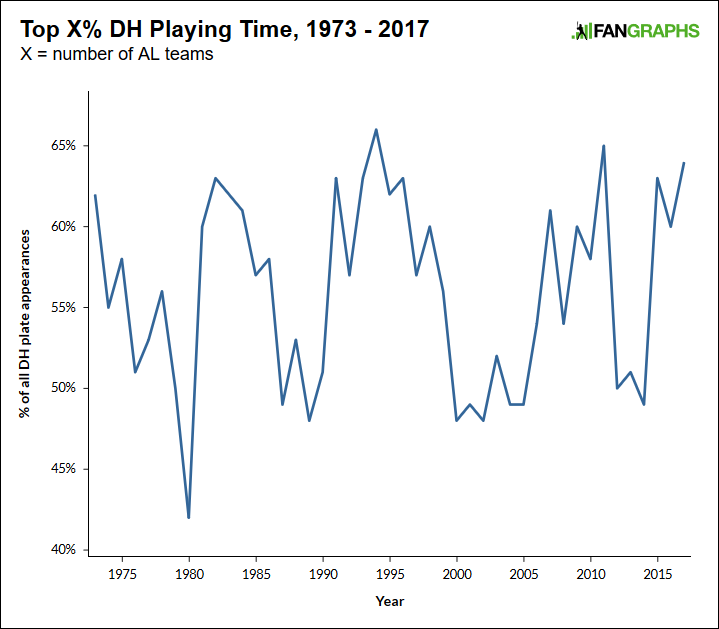 You see 45 years of AL hitting overall, and 45 years of AL DH performance. For just the second time on record, AL DHs hit worse than the league average. Typically, the DH has hit better than the average by about 12 points of wOBA. In 2016, the gap was 15 points, and the year before that, the gap was 17 points. 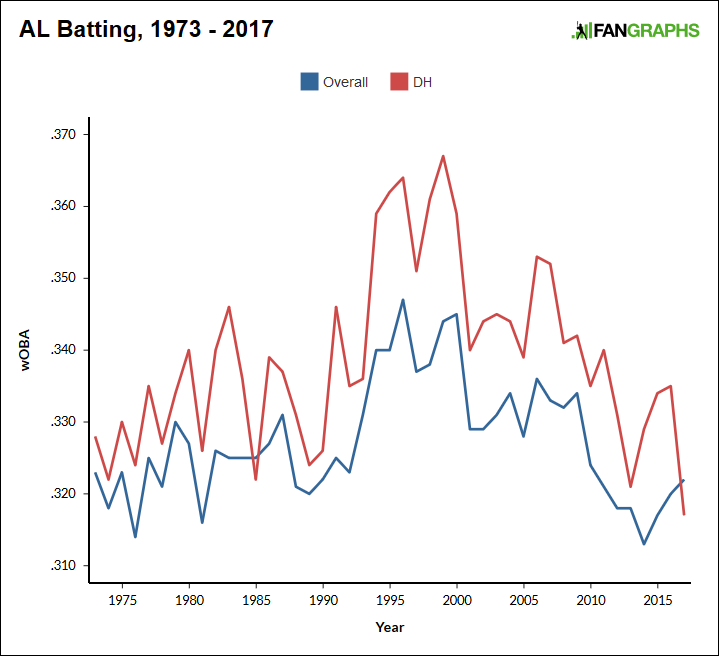 In 1985, the DH position was three points worse than average. And, this past year, the DH position was five points worse than average. The players whose job it was to hit did manage to hit okay, all things considered, but it just wasn’t enough. AL designated hitters collectively hit as well as AL shortstops. 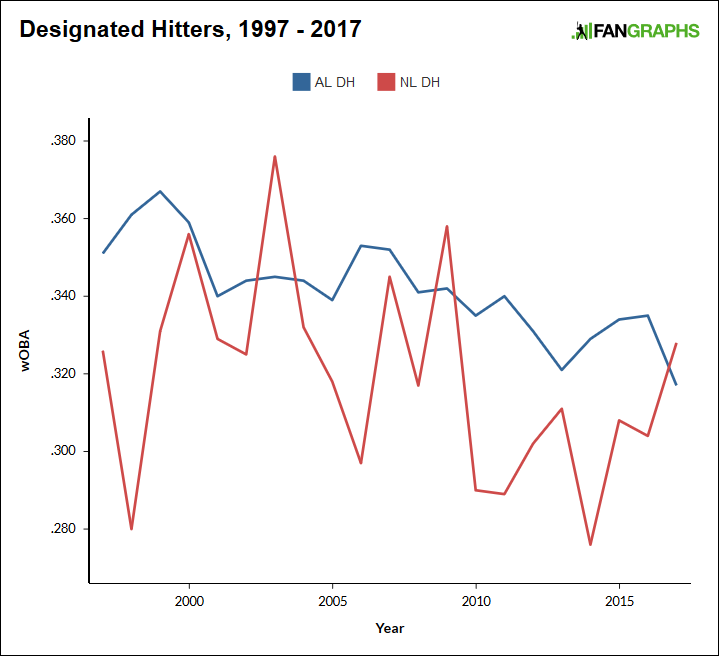 There’s been a theory going around that AL teams have moved away from permanent or semi-permanent designated hitters. I don’t actually see any evidence. This plot — the last plot — might take a minute to understand, but I wanted to see how much playing time the regular DHs have eaten up. So, for every year since 1973, I added up the plate appearances for the top X designated hitters, where X is equal to the number of teams in the AL. I divided that sum by the league total number of DH plate appearances. A few years ago, I might’ve bought it. The overall average here is 56%. As recently as 2014, the top 15 AL designated hitters accounted for just 49% of DH plate appearances. Last season, the rate was 64%. Importantly, it was also close to that figure in each of the two seasons previous. In 2014, there were four players who batted as a DH at least 400 times. This past year, there were eight. Regular or semi-regular DHs, then, are still a thing. It might just be cyclical. The issue last year was simply how many designated hitters failed to perform. Of course, before I say anything else, I have to acknowledge the retirement of David Ortiz. David Ortiz was a perfect DH, much like Edgar Martinez before him. Losing Ortiz is awfully difficult to recover from. But that’s not the entire story. Looking at wRC+ in 2016 and 2017, Carlos Beltran got worse by 48 points. Mark Trumbo got worse by 45 points. Hanley Ramirez got worse by 35 points, and Victor Martinez got worse by 34 points. Ryon Healy got worse by 32 points! Albert Pujols also got worse by 32 points. Robbie Grossman, 25 points. Kendrys Morales, 14. Last year’s only especially good offensive DHs were Nelson Cruz and Edwin Encarnacion. Corey Dickerson, to his credit, was also all right. Whenever you see a league-wide data point like this, it’s only natural to wonder whether you’re spotting the start of a trend. And, I don’t know, maybe in the exceptionally big picture, offense is being prioritized more than defense, because of shifting and reduced balls in play. Following that theory, it could become harder for DHs to separate themselves, offensively, from everyone else. But I don’t think that explains what happened, nor do I think this’ll repeat in 2018. For whatever it’s worth, AL DHs are projected to bounce back just fine, to a wOBA of .334. No one goes into a year expecting their designated hitters to be bad. And more generally, the American League wouldn’t develop a tolerance of under-performing designated hitters. Given enough time, teams will find players who hit. Even given the established DH penalty, there’s no good reason why DHs should hit worse than players at other positions, long-term. That’s what makes 2017 so strange. It’s not that it marks a transition between eras. It’s that it just happened at all. All DHs have to do is hit. For one entire season, they didn’t do enough. We hoped you liked reading The DH Just Had Its Worst Season by Jeff Sullivan! Coincidentally pitchers also just had their worst season, -20 wRC+. DH in the NL please. Eliminating the DH would be better than bringing it over to the NL.